The calendar says early October, but it feels like January in the Sierra. That is welcome news to Bay Area skiers and snowboarders. The early winter storm chased away record heat and has instead swamped Reno with record rain. Resorts like Heavenly got a good dose of snow in the higher elevations. 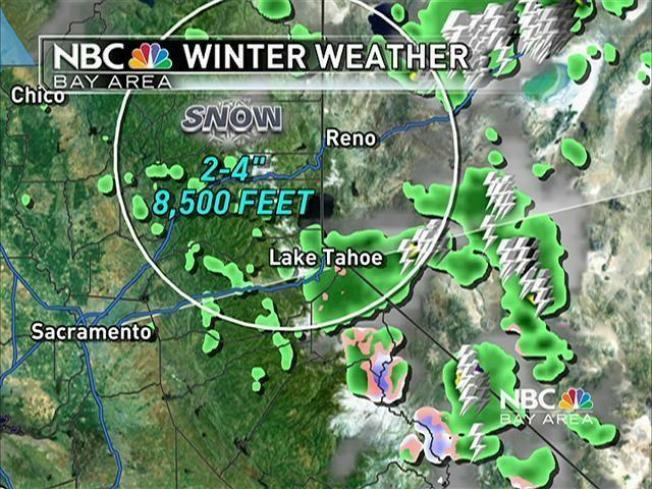 Heavenly reports up to four inches of snow at the Stagecoach lift, which is about 8,600 feet. The photos on this article are from Heavenly. The snow there caused a delay in the construction of a new mid-mountain lodge. Crews were putting in the 40-foot front windows when the storm shut things down for a time. They restart as soon as the snow clears. It also dropped enough snow in the highest elevations to close Highway 89 at Monitor Pass south of Tahoe. Chains were also required Tuesday on the Mount Rose Highway connecting Reno to Incline Village. Bad weather also closed Tioga Pass in Yosemite. The National Weather Service issued a winter weather advisory through 5 p.m. Tuesday for both Reno and Tahoe. Temperatures were in the upper 40s in Reno at midday Tuesday after setting record highs in the mid-90s a week ago. More than an inch of rain fell at Reno-Tahoe International Airport on Monday, breaking the old record of 0.23 set in 1994. The big ski resorts did not get any of the white stuff, but a weather pattern that brings anything wild and wintery to the Sierra is a good sign that a good ski season is just around the corner.